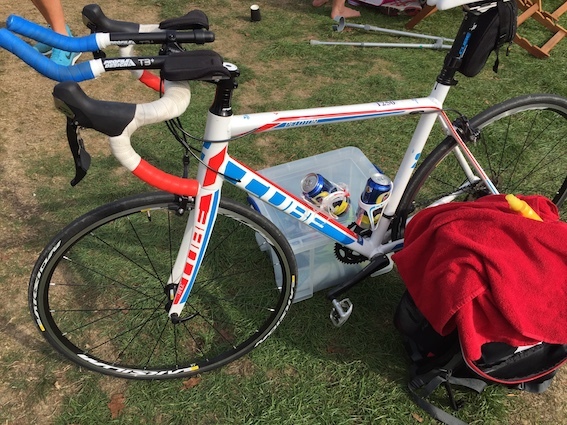 If you haven’t already heard I successfully completed my Triathlon on Sunday in 3 hours and 18 minutes…a little longer than my target time of 3 hours, but this course turned out to be far, FAR hillier than the Cambridge course that I’d been practising on. I came 858th out of the 1090 individual event finishers with 35 people unable to finish. After the cancellation of the Cambridge event I found another event of the same distance on the same day at Hever Castle just south of London. The intention was to stay in a hotel the night before the event so as not to have to travel down at stupid o’clock but a friend and work colleague stepped in and offered us a bed for the night so THANKS MOLLIE! 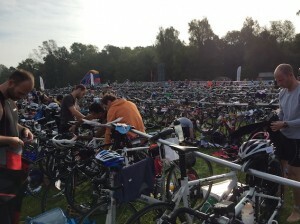 Despite all the planning everything on the morning of the event felt a little more rushed than it should have been, but it turns out they were running a little behind schedule so after racking my bike and preparing transition I actually got down to the lake ready for the race briefing and the swim start a good 10 minutes early. This was my first competitive open water swim and it was certainly interesting. I while I wasn’t expecting to be one of the slower swimmers this was still all new so I stayed out quite wide for the start. 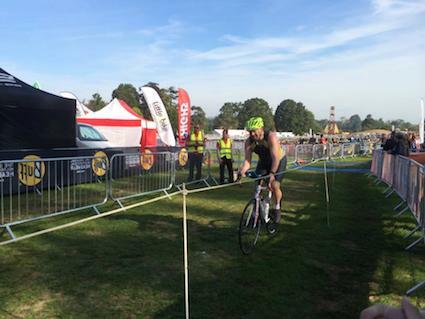 I got off to a good start and managed to hold my pace down and get into a steady rhythm. The water was several degrees colder than I’ve ben training in to the point where my cheeks were starting to go numb by the end of the swim, but it certainly wasn’t unpleasantly cold. Several times during the swim I found myself sandwiched between to people on converging lines but if seems that with everyone swimming in wetsuits you just tend to bounce off other people. I managed to not be in any large groups at the turns and pinch points so didn’t have anyone climbing on top of me at any point. 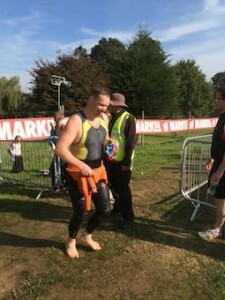 I felt OK by the end of the swim, exited the water with the help of the Speedo volunteers and headed over to transition (a couple of hundred meters total I’d guess?). In training I’ve not been able to get my wetsuit over the top of my Garmin watch so as planned snapped it off before taking the wetsuit down…here’s where my problems started. I was supposed to take off my hat and goggles, then the watch, put the goggles and watch in the hat then set about removing my wetsuit. Instead I just tried to hold all 3 things in one hand, juggling them over to the other as required, and of course managed to drop my watch. Turning round somewhat confused and wondering if I should just abandon it(!) another competitor ran past and said “If you’re looking for a watch it’s back there”. I had about a dozen people say the same thing to me as I headed the wrong way down the transition corridor but found it lying on the grass about 30 meters back from where I was when I realised I’d dropped it. A bit of time lost but not too bad. The run out of transition before the mount point was a hundred meters or so and the ride out of the castle grounds was probably half a kilometre…I turned left went around a couple of corners and hit what had been described in the race briefing as “a cheeky little hill”. What it was was a climb of just over 2k. By the 3k point of the ride I was almost 4 minutes down on my target pace (of 18mph average speed). 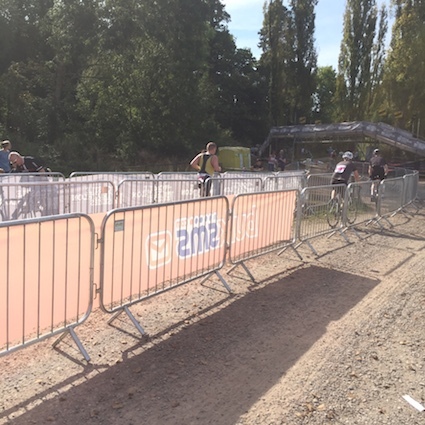 The relief was palpable when I hit a downhill section but was short lived as things started to go upwards again…we certainly weren’t in Cambridgeshire any more! Traffic was an issue on the ride as it wasn’t a closed course. Major junctions were marshalled but the road we all fairly narrow country lanes so there were a lot of places where the cars were being held up by bikes, who were holding up cars and more bikes. On the plus side this gave me time for an enforced rest in places. It also let me watch some particularly stupid cycling by some of the other competitors. On the aforementioned narrow counter lanes almost all of the cars were being very careful when trying to pick their way through the mass of exhausted cyclists. Some of the cyclists obviously decided that these cars were holding them up too much and decided they needed to undertake (really close to stone walls) to over take cars, on blind bends, while the cars were overtaking other cyclists. I was amazed that there wasn’t at least one addict reported during the day. After an uneventful transition I started the run with my legs feeling about the same as they had at the end of the half distance practice event I’d done last month, that being knackered. It’s not that I was tired and out of breath, just that my leg strength had already gone. Still, I trotted on assuming that as the meters drifted under me my legs would remember the training and things would begging to feel more comfortable when I turned the first corner on the run and discovered another hill! Before the event I’d set the pacer on my Garmin watch to 6 minute kilometre pace in an effort to keep my pace slow at the start of the run. There was certainly no chance of me exceeding it at this point, still, I kept my stride nice and short and pootled along in what I’d come to know as my first gear. After about 1.5k I started getting a twinge in my left knee, something I’d felt a couple of months previously that had stopped me from running for a couple of weeks. I recognised from that that because my pace was so slow I was clumping down straight onto my heel rather than running more forward but the problem is I need to run a bit faster to make that style work. I think I can safely say I made it up into gear 1.5 and probably no higher. I trundled on to about the 4.5k mark at which point I reached the steepest hill so far and with my slow run up that being at basically walking pace anyway I gave into the inevitable and walked up it. It was at this point I realised that this was now simply going to be an effort to finish and my other time goals were long gone. A nice chap asked if I was finishing or if I had another lap to go, and while briefly tempted to just head straight on through to the finished I instead turned right and headed off to lap 2, after first climbing up and down a scaffold ramp to take me over the bike track to allow me to start once more up that hill. On the second lap probably walked up half of that first hill and my legs were feeling in real trouble now, starting to get very sore and tight. 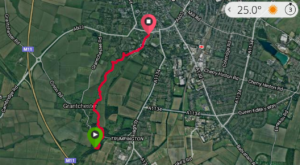 I decided I needed something artificial to keep me going so decided that I’d count up to 60…if in that time I wanted to walk I would, but only whenI’d got to 60, and than I’d only allow myself 60 seconds of walking before starting to run again. Using those intervals I probably managed to run for 5 minutes before walking each time and was plodding onwards to the water station. Unfortunately when I got there I discovered that either they’d not been topped up, or they had and had run out again so with no option and a very dry mouth I continued my intervals. Around 1k later a buggy headed against the flow of runners towards the water station. One of the runners behind me stepped in front of it to make it stop and said they needed water now! The chap driving suggested taking one of the containers off for everyone there and let him carry on toe refresh the water station. That prompted every runner in the area, including me, to stop and take a swig out of a 10 litre container…lukewarm water has never tasted so good! I continued with my intervals until, about 10 seconds into a walking piece I realised that there was a small group of spectators on a bench cheerful shouting “Go on Twelve Fifty (my race number), give us a little jog, you can do it! Jog! Jog! Jog!”. I had to smile and I had to get moving again, upon which I got a cheer and a round of applause from them all. 1km later and just as I was about to walk again when two fire year old buys screamed at the top of their lungs at me “GO ON, YOU CAN DO IT!”. Fine, I’ll carry on running then. That typifies what the crowd, and the marshals, were like all day. Helpful, encouraging & cheerful, and I’m sure I wasn’t the only one who was helped along to the finish by some complete strangers. I should also at this point mention I was also helped along by Mollie, who’s house we’d stayed at the night before and her husband who came along to shout encouragement, and by my wife who at this point to bored to tears of Triathlon training talk but nonetheless kept popping up at different points along the route, in and out of transitions to keep me going. 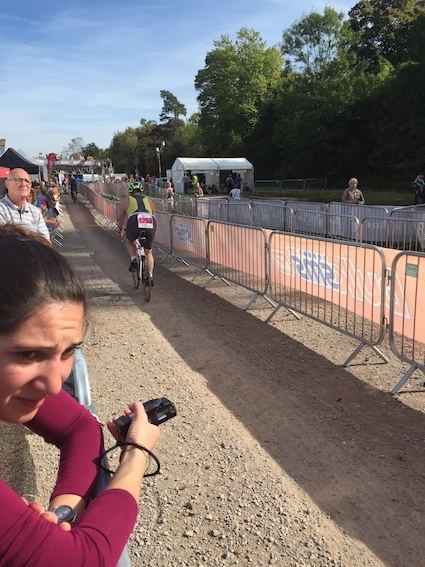 Round the final corner and up (walking) that damn hill again and down the last 500m to the finish…mission accomplished. I got my medal, a large cup of water, and access to a table full of cakes, fruit and other drinks. I grabbed a coconut juice & some watermelon and walked, without counting now, to get my tag removed and leave the finish area to meet my wife and collect the cold(isn) beer that was in my bag. The final word should go to everyone who’s helped me over the last few months, and particularly to everyone who sponsored me. 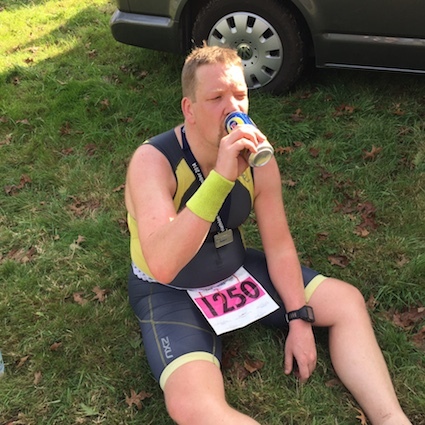 I have aimed to hit £1000 but in reality thought I’d be lock to hit £500…and the time of publishing (and a couple of people have added in after the event know I’d actually finished) you have helped me raise £1,375 for Cancer Research UK so thank you, thank you, thank you! On Sunday 31st August I took part in my first actual Triathlon, the Ely Sprint event. 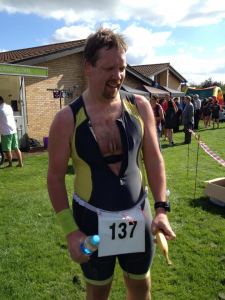 This consisted of a 300m swim (in an outdoor heated pool), a 20km bike ride and a 5km run. 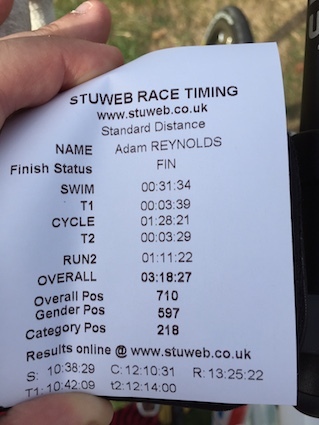 I finished up with a total time of 1:16.59 which I was actually pretty pleased with considering the heat of the pool and the cross country nature of the run course…but boy did it ever hurt! If the “Sprint” Triathlon last weekend proved one thing it’s that I’ve got a lot of running to do in the next 25 days. The swim was pretty good although not quite as quick as I’d like. I’m putting this down to the water temperature (I heard someone say 31 degrees!) and the curved nature of the ends of the pool. That might sound odd but it makes it pretty hard to spot the distance to the wall properly and meant I almost missed a couple of turns. As expected, I also went out too fast, something I need to make sure I’m more careful about when I’ve got a whole mile ahead of me rather than just a few pool lengths. The ride felt good even though the Ely course is quite rough. It feels quite nice to overtake someone riding a full Carbon bike complete with aero frame and disc wheels on my little Cube, although it may have meant I was going along a bit quicker than planned in some areas. Despite having done several brick (bike to run) training sessions, my legs felt wiped out right from the start of the run. I think I walked once over the whole run but that was up one of the steep little hills that were on the course. I was happy enough with 29 minutes for the 5k run, it’s not much slower than I’ve been running the Saturday morning Park run at Milton Park, but the way my legs were feeling I’m not sure I could have gone round again for a full 10k.